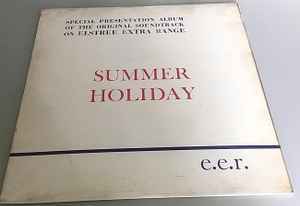 This was the first recording of the Elstree Extra Range (e.e.r.) Sound with the next being the similar release for 'Wonderful Life', which was a run of 150 copies. It's a double LP with sides 1 & 3 coupled together and Side 2 backed with a plain unplayable side. On each of the 3 playable sides, there is the wording 'With Best Wishes To' then a blank space for the recipient's name to be entered. The labels state 'e.e.r.' logo around the rim with further details including notice of 'Special Recording Limited To 80 Copies - Not For Sale'.